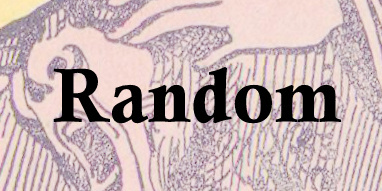 Guest post by Zachary Foster, with additional insight from Mustafa Aksakal and Graham Pitts. World War I saw the rapid spread of diseases in the Ottoman Empire.Soldiers who were frequently on the move between battlefronts became ideal carriers for many types of microbes, while mass deportations like those of the Armenian genocide also contributed to outbreaks. The war drove up the price of soap and made it prohibitively expensive for many across the region, further hastening the spread of diseases. And, as famine and starvation began to spread across Syria, especially Lebanon, emaciated bodies became particularly vulnerable to diseases, especially Typhus, known by some as ‘hunger typhus’ for its tenacity to attack the malnourished. Fever, TB and Cholera also spread rapidly during the war. 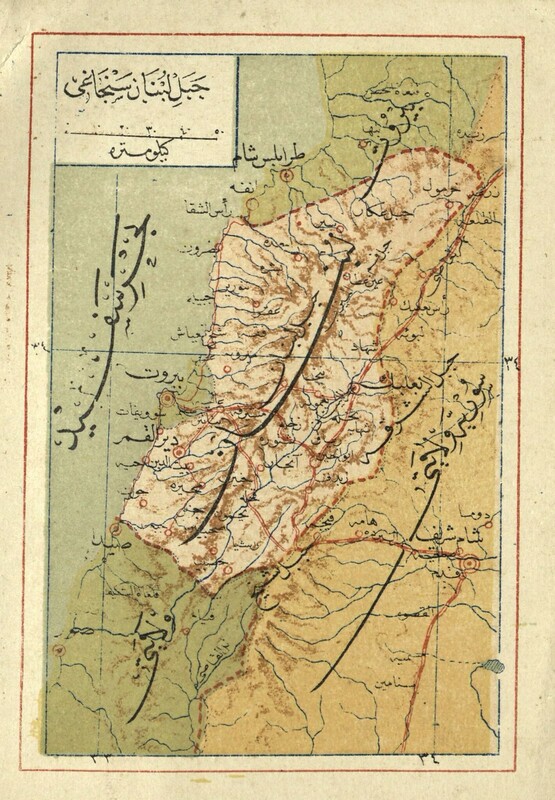 And so the Ottomans undertake a campaign to create disinfection stations across the region, as seen above in this map of Mount Lebanon produced in (roughly) 1915. The red crescents show canteens (matam mahalleri gösterir); the dark crescents represent disinfection stations (tebhir istansyonlar gösterir); the half-red half-dark crescents indicate canteens that include a disinfection center (matam mahallerinde tebhir istasyonun mevcudunu gösterir). The disinfection centers were established under a new law called The Regulation for Communicable Diseases ( Nizam-i Emraz-i Sariye), as Dr. Tanielian has shown, which required all cases of diseases to be reported within 24 hours to the local health authorities. Although it is unclear what kind of disinfection took place at the centers – probably a combination of treatment and quarantine – this was a clear attempt to expand the role of the state in monitoring and controlling the spread of diseases. Whether or not we interpret this as some kind of cynical state effort to penetrate citizens bodies, a “site” for “locating” “tropes” of “modernity” on the “citizens’ bodies, or whether this was a genuine attempt to limit the spread of diseases – that is a question that we shall leave open for readers to ponder and debate. The canteens (red crescents) may well have been rudimentary soup kitchens, although it is not entirely clear what kind of food assistance was actually offered, and to how many people. We do know that the Ottomans opened up soup kitchens throughout the region to assist the starving poor. Still, hundreds of thousands of people starved to death or died from starvation related diseases, many if not most in Lebanon, and so the canteens seem to have done little to stave off the starvation. Note as well that the shaded regions include the six districts of the Mutasarrıflık of Mount Lebanon, an administrative region that was created in the aftermath of the 1860 violence in this Mountainous part of the Eastern Mediterranean. (See this turn-of-the-century map showing "The Sanjak of Mt. Lebanon" at left) The inter-communal violence sparked European intervention, and so the district’s governor was, from that point on, to be appointed by the Ottoman Sultan, but approved by the Great Powers (an arrangement that was quickly abolished at the outset of the war). Thus the district has often been considered a ‘semi-autonomous’ enclave, and was intended to be a sort of ‘haven’ for Maronites. The six districts include, from south to north: Jezzine, the Shuf, Beirut, Keserwan, Batrun and Kura. Note that this region is quite a bit smaller than the Lebanon that the French would carve out in the post-World War I period, which would include many additional surrounding regions, including Tripoli, Saida, Sur, Bınt Jbail, Zahle the Bekaa valley, Akkar and more. 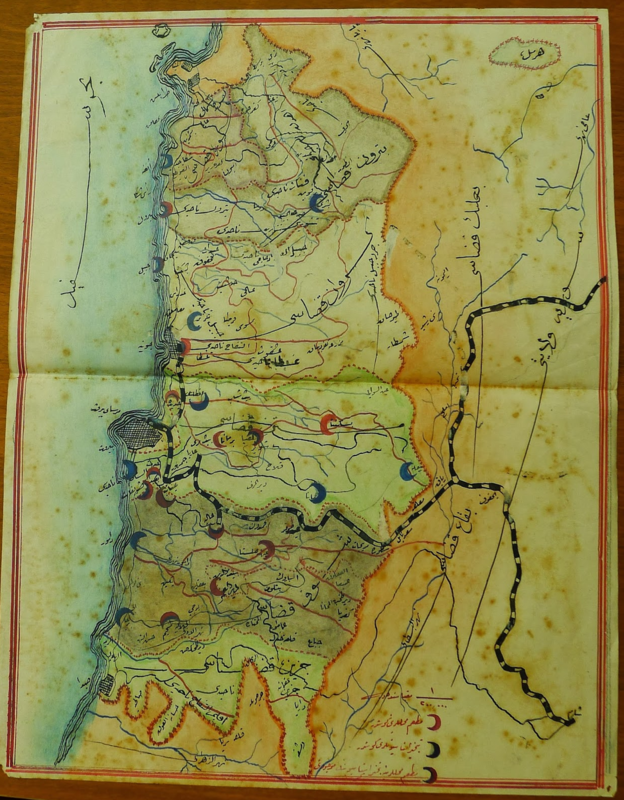 The Ottoman bureaucrat who painted today's map was clearly a talented artist. Notice the topographical features, such as the sea shore, the large urban spaces (checkered in black) and rivers (a faint blue). The thick black-white line is the railway that connects Beirut to Damascus. The red x’s represent the boundaries of the district.